The British pound has borne the brunt of the markets’ punishment of a Brexit vote last week. 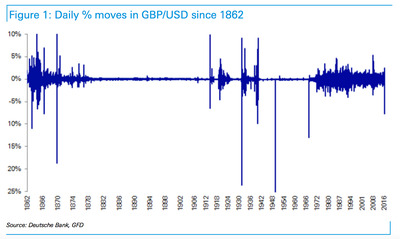 Sterling’s 7.64% drop on Friday against the dollar was the largest drop since the collapse of the Bretton Woods currency system in the early 1970s. It may be rallying a little on Tuesday, higher against the dollar on the day to trade at $1.3296, a gain of around 0.5% from the close on Monday, but, according to Deutsche Bank’s Jim Reid, this week has been one for the history books. Only 8 other days have been more negative for Sterling since 1862 — more than 38,000 trading days. 8) 19 June 1866: (-7.76%). 7) 25 Sep 1931: (-7.89%) A few days after the Gold Standard was abandoned, the pound continued to depreciate although it did jump by 7.14% next day. 6) 10 May 1940: (-9.79%) War related deviation from the dollar peg. 5) 25 Mar 1863: (-10.90%). 4) 20 Nov 1967: (-13.02%) Devaluation to battle the UK’s economic problems. 3) 30 Sep 1869: (-18.75%). 2) 21 Sep 1931: (-23.57%) Gold Standard abandoned in the Depression. 1) 19 Sep 1949: (-30.41%) Pound devalued under Bretton Woods due to economic concerns.